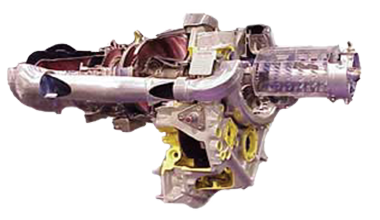 AeroTrain Corp. Model AE-32 Turboshaft engine trainer is a runnable Allison 250 engine (or its military equivalent T63 engine) mounted on a mobile stand capable of full operation through a console. It provides a cost-effective training resource for hands-on training in any AMT program. The trainer comes with all the necessary instrumentation and controls to run the engine. The engine is mounted with all necessary electrical wiring, engine accessories, controls, and instruments that are needed for running the engine. The students may also be trained to remove and replace parts for field level maintenance practice. 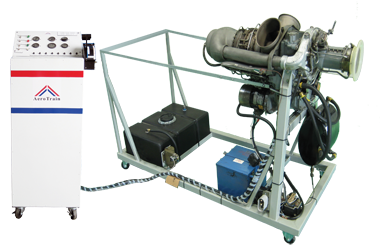 Engine is mounted on a portable stand with casters,with complete starting system and a serviceable NiCad battery. As an option in Model AE-32-A, engine controls console is mounted on a separate moveable stand. 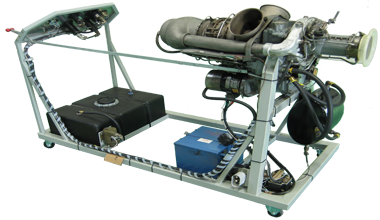 The engine trainer may be mounted on wheels for easy mobility as shown above. For fixed installations, the trainer is provided with heavy duty vibration and shear mounts to absorb vibrations. The trainer is supplied with comprehensive documentation comprising of electrical schematics, user manual,training manual, and computer based training (CBT). Oil System: Return System with Pressure and Scavenge pumps, External Oil Cooler and Tank. AE-32-250-1: Allison 250 engine on a run-up stand with integrated controls.AE-32-250-2: Allison 250 engine on a run-up stand with operation console, connected through umbilical cord.